- Sari Colt on 三月 15, 2016. Prospectors & Developers Association of Canada (PDAC) hosted its 84th annual convention from March 6th to March 9th, 2016, bringing together the exploration and mining industry. PDAC represents 8000 members, making it the voice for the Canadian mining industry. Over 22,000 attendees from Canada and all over the world gathered in Toronto, to discuss current issues affecting the industry, to network with industry members and government officials, and to celebrate the importance of the industry for the world economy. For Canadians, the mining industry is an important source of employment with over 375,000 Canadians working in the field, and is the largest private sector employer of Aboriginal peoples in Canada. Some of the PDAC highlights included the International Mines Ministers Summit (bringing 16 Mines Ministers from various countries), the Aboriginal Program, the Capital Markets Program, the CSR Event Series, the Corporate Presentation Forum for Investors, the Core Shack, the Technical Program, the Targeted Geoscience Initiative 4 and the Trade Show: Investors Exchange and Mining Marketplace. There were several interesting exhibits including the De Beers Diamond Display, the Kirwin Collection Mineral Display, the Royal Canadian Mint Display and the Tesla Model S Exhibit. 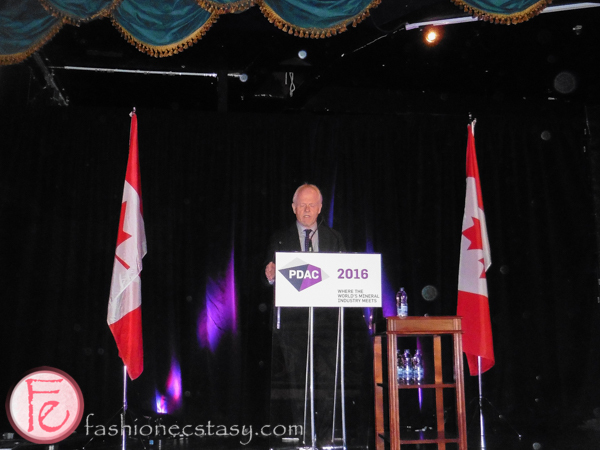 The opening media reception was held at the Fairmont Royal York Hotel and had Rod Thomas, current president of PDAC addressing the guests. Andrew Bell, BNN anchor, was quite witty in his words as well. Other noteworthy attendees included Dr. Carolyn Bennett, Minister of Indigenous and Northern Affairs and the Member of Parliament for the riding of Toronto—St. Paul’s, Isadore Day, Ontario Regional Chief for First Nations, and Bryan Hendry, Senior Advisor Policy and Strategic Communications for Chiefs of Ontario. Prospectors & Developers Association of Canada 2016 concluded with an optimistic look on the future of the mining industry and plans for PDAC 2017 are already on their way.